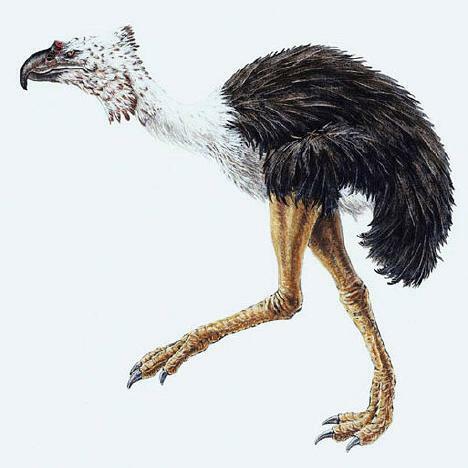 The Phorusrhacids (which means "rag bearers"), popularly known as "terror birds" were large carnivorous flightless birds that were native to South America - although some species did manage to establish themselves in North America after the Isthmus of Panama land bridge arose about 3 million years ago. Phorusrhacids first appeared in the Paleocene epoch, about 62 million years ago, and survived until the late Pliocene, about 2 million years ago. Many Phorusrhacids were quite small, about to 2 to 3 feet (0.6 to 0.9 meters) tall, but the largest species were enormous standing 10 feet (3 meters) tall. The larger species were almost certainly fast runners, and might have been able to reach speeds of as much as 30 mph (48 km/h). Phorusrhacids are believed to have generally had beaks with a hooked-curve, similar to that of an eagle, and additionally their feet may have had sharp claws. Generally speaking, most Phorusrhacids had shorty, stubby and effectively useless wings, however the wings of one genus, Titanis, seem to have a joint-like structure, digits that could flex to some degree (unlike the fused digits of most birds), and may even have ended in a clawed finger.